Brianna received her Master of Occupational Therapy from the University of North Dakota. She has over four years of experience working primarily in outpatient pediatrics, but Brianna also is skilled in acute care, inpatient rehab, and adult outpatient treatment. 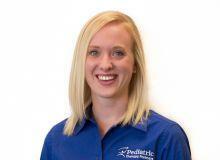 Brianna has been trained in the SOS approach to feeding and in PAMs (Physical Agent Modalities). Brianna specializes in working with children with developmental, neurological, and physical disabilities as well as feeding difficulties. She also has additional training on brain development.